I rarely find a recipe that I don’t tweak or change. I also don’t make many dishes with only a few ingredients and/or spices, but this is one of them. It’s perfect. 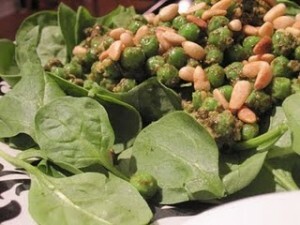 This salad is such a great sumer dinner. Not only does it have great flavor and texture, it takes 5 minutes to throw together. We had it for dinner tonight on its own, although it would be great with some crusty bread, and a grilled chicken breast marinaded in pesto. Place all ingredients in a bowl. Toss. Eat. * I really like to use the frozen baby peas from Trader Joe’s.